Philadelphia Eagles quarterback Carson Wentz indeed gets two thumbs up for his play so far this season. 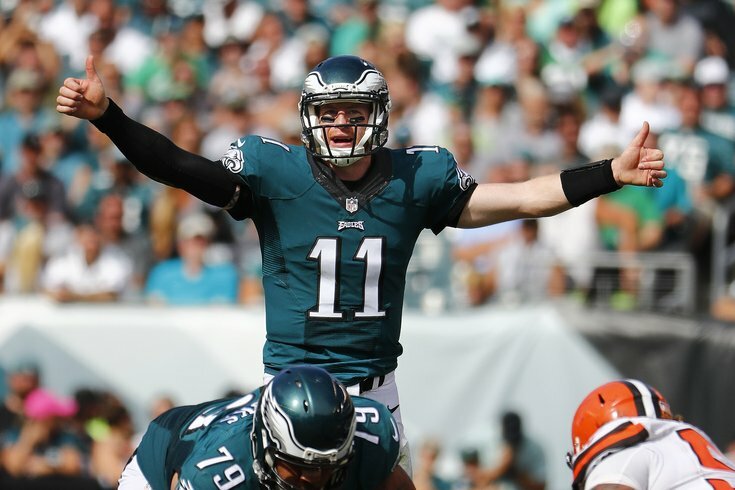 Few predicted that the Philadelphia Eagles would enter the bye week undefeated. Far fewer predicted that they would do so in dominating fashion, winning their first three games by an average of more than three touchdowns. Fewer still predicted that Carson Wentz would play as big of a role in that start as, say, a defense that some believed could be among the best in the NFL. And, as is often the case, the gulf between expectation and reality has made the surprising early-season surge by Doug Pederson’s team all the sweeter for Eagles fans. It’s like going to a world-renowned restaurant and being disappointed that your meal failed to live up to the hype. Had you been served that exact same dish at a hole-in-the-wall, you’d likely rave about a surprisingly good meal to your friends the next day. Right now, that’s exactly what the Eagles are — the $14.99 filet mignon that shattered expectations. They’re not served at Barclay Prime. Not yet, at least. They’re the best meal you’ve ever had at a chain restaurant. And instead of a side of asparagus, they’re served with a Bloomin’ Onion. In case the food metaphor is lost on you, let’s take a little trip back in time to when the Eagles found themselves on the other side, the wrong side, of this common failure to reconcile hope and reality. And it’s a fairly short Delorean ride. August 29, 2015. Green Bay, Wisconsin. Sam Bradford goes 10-of-10 for 121 yards, three touchdowns, and a near-perfect passer rating of 156.7 in the Eagles third preseason game against the Packers. And what happened? Only one of the most disappointing seasons in recent Eagles memory, ultimately leading to the firing of Kelly the day after the season’s penultimate game. Predictions of 10, 11 or 12 wins were not uncommon heading into the season. Instead, it was a 7-9 finish and the end of Kelly’s tenure at the helm. Enter Doug Pederson, who couldn’t be more different than his predecessor if he tried. His arrival was met with initial skepticism, but that was quickly pushed to the side when the team traded up to draft Wentz with the second-overall pick. The rookie QB, originally slated to spend the majority of the season inactive on Sundays, offered longterm hope for Eagles fans, but did little to change the immediate outlook on the upcoming season. And following the decision to trade Bradford to the Vikings, expectations were further tempered as the fanbase began to view 2016 as a rebuilding year, a learning year for both the North Dakota State product and the rookie head coach. Many believed the Eagles would win eight or fewer games. And just three games into the season, they're already halfway there. Let’s not get ahead of ourselves. I wrote something similar back in May when the Phillies rattled off 15 wins in 21 games following an 0-4 start to the season. What’s important now is to enjoy the ride without suddenly elevating your expectations to unrealistic heights. Instead, let's try to keep all this perspective. The wins, they're great. But should there be a regression in the coming weeks, try to remember what you would've considered a success prior to their opener against the Browns. Not only will that make it easier when the first loss eventually arrives, but it would be unfair to Wentz, Pederson and the rest of the team to hold them to a higher standard just because they're suddenly bursting through whatever ceiling you placed on the season. If I know Eagles fans — and I think I do — that’s easier said than done. The losses will likely still hurt, but if you view them as part of the larger picture of building towards the future and remember those preseason expectations are still relevant, it will definitely help. Pederson is taking a similar approach as his team heads into a poorly-timed bye week. His job, which includes managing egos in addition to rapidly growing expectations, isn't going to be easy. However, he seems to be taking the right approach. “The biggest thing is complacency. You think you've arrived. You think you are all that," Pederson said when asked about the challenges of heading into the bye as the hottest team in the league. "When that creeps in, that's when you get beat. It's my job not to let that creep in. I've got to keep the guys focused and grounded. I told them this week they're going to travel and go home and people are going to pat them on the back and say how great they are. That should be the same for all Eagles fans, at least if you want to savor the rest of Wentz's rookie season. Try, as difficult as it may seem, to forget about what the Birds did to the Browns, Bears and Steelers. Don't hold them up to that standard, not because they aren't capable of being that dominant, but because they aren't ready to be that dominant on a consistent basis. And if you expect perfection, the rest of the season could wind up tasting like a bland, overcooked steak rather than an eye-opening, totally-satisfying experience from an unlikely source. *You're likely going to disagree with the order for some of these, but don't worry about that. It's just my opinion and doesn't actually mean anything. And for what it's worth, I would've had the Steelers game ranked as their third-most difficult game had I done this prior to the season. If the Eagles go 7-6 the rest of the way, that might seem like a disappointment. But only if you're comparing it to their first three games. Because if I told you on September 10th that the Eagles were going to finish 10-6 this season, you'd likely take that in a heartbeat. But when it comes to viewing the season as a success, the wins and losses should mean far less than how Wentz and the rest of the team plays in those losses. Could they go 3-10? Absolutely. How about 10-3? That's possible too. Aside from a bunch of wins, the biggest difference between those two records -- and how they'll be received by the fanbase -- simply depends on the expectations you place on the Eagles moving forward.